Life seems to be easy for some people. However, when we look at these people we do not know what is going on in their lives. Everyone has struggles. Many people would argue that money would solve all of their problems. But money is not the answer. There have been many people with money take their own lives because they could not deal with reality. Look at Michael Jackson. He did not commit suicide, but he certainly was not dealing with life in a positive manner. Whitney Houston is another example of someone who was rich and famous yet turned to drugs in order to deal with life. Everyone has issues in their lives that they deal with. Some people are able to deal with difficulties better than others. What is the answer? How do we get through difficult times in our lives. The answer is different for everyone. The simple answer is that we just go on with life. Take life day by day and move forward. We also need to protect ourselves emotionally. Sometimes that even means putting aside relationships of people who may be close to us, but are not healthy for us emotionally. Yesterday was a difficult time for me. I saw my mother for the last time. She and I have had a strained relationship for some time now. In recent years I thought things had improved. However, a lifetime of emotional abuse came to an end yesterday. I went to visit her in the facility that other family members had put her in. This was the second time this month I went to visit her. Since I live in Las Vegas and she is in Iowa it is has not been easy to see her. I have been able to bid for some Omaha overnights that give me enough time to visit family. I went to the facility where she has been for the past few months. We talked for a while until she started saying hurtful things. I realized at that point that I did not want to return and allow her to treat me in the manner in which I was all too familiar with after a lifetime of not being able to please her. I told her I was done with her emotional abuse, that I was leaving and would not return to see her again. Her response was something that was pretty typical for her. She did not ask why I was upset. She did not ask me to stay or why I was not coming back. The only thing she wanted to know was if I would take her outside so she could have another cigarette. I know many people will think that my leaving was harsh and cold hearted. Everyone is entitled to their opinion. However, there are times that moving on is the best thing. I made a decision based on what I felt was best for me. Some people may call it selfish. I call it surviving emotionally. People who have not suffered from abuse of any kind will most likely not understand. I am a survivor of both physical and emotional abuse. I accepted these things a normal for years. It has only been within the last few years of my life that I realized I need to stop making excuses for those who would abuse me and move on. I did not know what real love of others was like until I married my wife, Jeanmarie. She grew up in a home where people cared for each other and valued both family and friends. I thought at first that I might regret walking out yesterday. But then I remembered how I had to force myself to go see her due to the fear of things she might say to me. I have experienced her sharp tongue way too many times. Now what I feel is relief. I will no longer have to force myself to go visit her. In a perfect life parents would treat their children with love and kindness and the children will show respect towards their parents. However, this is not a perfect world. Life is not always as we wish it would be. I have had other people in my life who were great role models. People like Al Tidlund. Al was a man I went to church with when I lived in Springfield, MO. He was a man of honor and integrity. He and his wife were married close to sixty years. For the last few years of their lives his wife was homebound. I remember Al being at church some times and saying to me that he could not wait to get home and see his sweetheart. His son Russ adored and loved his parents. Al was the type of man that I wish I could be. The highlight of all my hours of flying was being able to take Al flying one night and let him get his hands on the controls of the Cessna 172 that I took him up in. He was a bomber pilot in World War II and had not flown an airplane since the war. Being able to take him flying and control the airplane was a joy for both of us. I miss my friend Al. He was a person who knew how to love and treat others. So what is the answer on how to get through difficult times? First, do not dwell on the past. Second, take the negative and turn it into positive. For example, if you were abused take that abuse as a lesson in how not treat people. Third, surround yourself with people who can be positive influences in your life. People like Al Tidlund. Forth, do what you can for others. The more we do for others, the less we worry about our own problems. When you do for others you just might find out that your problems are not as difficult as you thought they were. Since my interview with CNN I have had people tell me I should write a book. I have been going though my mind over and over as to what I would actually write about. I have been told I have had an interesting life and it would be something that many people would find appealing. I have never considered myself an interesting person. I have done some things in my life that not many people have done. For example, I rode bulls for eighteen years. Additionally, I am now an airline pilot. My guess is that there are not many people who have done both of these things. I have actually started this book. I have one whole chapter almost done. I came up with what I think is a catchy title, "The Prozac Pilot, My Flight From the Darkness Within." When I made my video a few years ago I had no idea that it would get the attention that it has. I did hope to possibly help others when I started this blog. But I did not fathom that I would get world wide readership with people from all over writing to me asking for assistance. Even after all of this attention it is still not easy to talk about mental health issues in public. There is still a stigma that surrounds people who suffer from depression. Yes the FAA has approved four different antidepressants for use by pilots. However, this is still not a topic that many people are comfortable talking about. My guess is that there are still pilots who are on medications that have not come forward and are keeping their ailment a secret. Part of the reason that many people who are medications may not come forward is the one year waiting period to reapply for their medical. Being grounded for a minimum of one year for a professional pilot can be financially devastating. Also, when a pilot reapplies for his or her medical after the waiting period he or she is not assured that his or her medical will be reinstated. For nonprofessional pilots the options may be opening up soon. There is currently legislation in congress that would allow smaller aircraft, including twin engine pistons to be flown without a medical certificate. There is one thing to keep in mind regarding this possible new ruling. I am guessing that this will be similar to the medical qualifications for Light Sport Pilots. Light Sport Pilots are not required to hold a current medical. However, Light Sport Pilots must ground themselves if they know of any medical reason that would make them unsafe. Additionally, a person who has been denied a medical does not qualify for a Light Sport certificate. I am looking forward to see what happens with this legislation that is in congress now. Currently, there are some limitations that I feel need to be removed from the bill. Pilots without medicals will be limited to VFR flights only. I feel that if a person is instrument qualified there should be no reason that they should not be allowed to fly under instrument flight rules. I think this is an area that we should contact our elected officials and make it known that these types of limitations should be lifted. It seems as if I have drifted from my original topic of this post about me writing a book. I guess I am going with what my sweet wife told me to do when I told her I had writer's block today. She told me to start free writing and things will come to me. Therefore, I am on here just typing away as things come to my mind. Much has happened since I made that silly video back in 2008. I have been without a medical and now have it back. I have done some flight instruction and sold airplanes. I am now flying for an airline. I even had a period of selling insurance when I thought I would never have an FAA medical again. Since the original CNN interview I have received emails from around the world. Some of these emails are from people expressing thanks for me speaking out. Other emails are from people asking questions regarding the current regulations. I have been able to offer words of encouragement to some people wanting to get into aviation. I enjoy being able to help in any way I can. Hopefully, if I can get rid of this writer's block so I can write a book that will help others. Well, enough free writing for now. Life is meant to be filled with joy. However, many people go through each day not knowing how to experience life to their full potential. Enjoying life does not always come natural. Some people actually have to work at being happy. However, just because life is not always easy does not mean that life cannot always be enjoyed. I know my last statement seems somewhat odd. Well, I have never been accused of being normal. But yes, even in times of dismay and difficulties life can still be enjoyed. Many people may ask how do you enjoy life in times of tragedy. That is a fair question. Here are some examples. One of the most difficult things to experience in life is the lost of a loved one. Yes, the death of someone close to us is tragic and causes great emotional pain. Depending on who that person is there may be sadness that will be felt the remainder of the survivor's life. However, do not mistake this sadness for the lack of joy in life. Sadness is a natural emotion people feel for a variety of reasons. Sadness does not need to diminish the joy you feel about life. How on earth can someone feel joy and sadness at the same time wold be a fair question right now. Let me go deeper into my thought process. When we loose someone close to us we most certainly feel sadness. Some people go into deep depression. But that deep depression is an entirely different topic than what I am talking about today. Lets focus on normal sadness. There are some religious funerals that the service is more of a celebration of the person's life than anything else. If we take the time during our sadness to remember the good times and what that person meant to us then we are experiencing joy amid our sadness. Yes, it is a difficult time. But we can still make the best of these times to become better in our own lives. I have experienced great loss in my life. I am also a survivor of childhood abuse. For years I let these difficult things in my life keep me from what was important. The important thing I refer to is enjoying life and doing the best I can at being the best me. The best me. I like that phrase. I just came up with it. What does it mean to be the best me? The answer to that will differ for everyone. Each of us has our own limitations as to what we can do in life. For example, being the best me to someone confined to a wheelchair is certainly different than the best me to an NFL football player. We each have things in our lives that we can work on to improve and become better in our lives. I do not talk about personal accomplishments either such as sports. I am talking about being the best person each of us can be in life. When I was without my FAA medical beginning in 2008 I had to learn all over how to be the best me. I was a pilot. That is who I thought I was. I did not have a medical and could no longer fly. This was a great lesson to me in life. I leaned that flying was something I did, but not who I was. Most of us relate our lives to what we do for a living. As we do this we fool ourselves into believing that is what life is all about. Life is not about flying airplanes, playing football or anything else related to what we may do for a living. These are simply things that we do. Life is about becoming better people each day. Life is about doing for others. Life is about growing through our personal joys and pain. Life is about finding the courage to move forward when we are certain that we cannot. Life is about treating ourselves and others in a positive manner and with dignity. When I could not fly I could have just thrown in the towel and gave up on life. But I did not. I moved forward. I overcame the odds that were placed before me. I became a better person for this. I was able to take this negative thing in my life and turn it into something positive. Each of us has good within. It is up to us to tap into that good and do something with it. I have seen people who have severe mental and physical disabilities yet they were able to do something that helps others. In some cases these disabilities may be so severe that they are confined to a wheel chair and do not even have the ability to speak. But what they did was smile. If you have ever known a person like this and had that person smile at you, then you know the heart warming feeling when that person smiles at you. There is no denying the great feeling to receive a smile from a severely handicapped person like I have just described. This brings to mind a fond memory from years ago. I was at church and feeling down. I do not recall what had me feeling so bad. I was sitting in a chair in the foyer of the church I attended. There was a family that had a sixteen year old down syndrome child named Cody. As I was sitting in this chair Cody came along and sat on the arm of the chair. When he sat down he put one arm around my shoulders. With his other hand he gently stroked my left arm in an attempt to comfort me. He did this for a couple of minutes, then he stopped. When he stopped he pointed to a picture of Jesus that hung on the wall behind us. As he pointed to the picture he said, "Papa." Cody then returned to caressing my arm. After a couple of minutes of doing this he again stopped, pointed to the picture and said with more emphasis, "PAPA!" After doing this Cody stood up and walked off. I will never forget how warm this made me feel and the wonderful thing that this young man did for me. Cody was being the "best me" that he could be. Yes, sometimes life is difficult. Life is not always easy. Some people will say that life is never easy. But whether or not life is easy we should always strive to be the "best me" that we can be. We should each look at our own abilities and not our limitations to do the best we can each and every day. Life is meant to be enjoyed. Life can only be enjoyed if we make an attempt to do so. I have made it to the world of FAA FAR Part 121 flying. For those of you who do not know the lingo, that means I am now flying for an airline. My long delay on writing anything on this blog for the past several weeks was due to being in training. 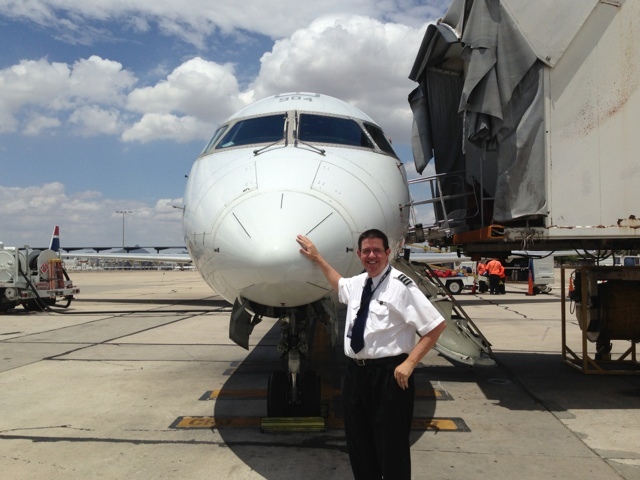 There was much to learn on the systems of the CRJ 900. But I do believe that most of the pressure on about everyone in my class came from not learning the systems, but in the expectations we put in ourselves. I have wanted to fly for an airline for some time now. I am not sure why I have not in the past. Perhaps due to being able to get into charter work with better pay. This certainly is a very different kind of flying. With flying charter a pilot may fly up to three hundred hours per year. A pilot flying for an airline will fly closer to 1,000 hours per year. The training itself was intense. But not as overwhelming as I had anticipated it to be. I had heard stories of how in depth airlines expected its pilots to know the systems. However, my company has the same philosophy as what FlightSafety International has, which is, if you cannot do anything about it from the pilot seat, you do not need to know about it. I other words, I was not expected to know how to build the airplane. It feels great to be back in the flight levels. The view from above is as wonderful as I remember it being. I always loved seeing another aircraft passing the opposite direction just 1,000 feet above me when I was at altitude. The closure rate is over 1,000 miles per hour. Yes, I did say over one thousand miles per hour. But the other day I saw something I had never seen before. Even the captain I was flying with who had several thousand hours flying jets had not seen this. We had two aircraft approaching us in the opposite direction at the same time. One of these airplanes was 1,000 feet above us and the other was below us. I wish I would have had time to get the video going on my iPhone to get a good shot of it. This was amazing to see. I am using a new Sennheiser Digital S1 general aviation headset. The noise reduction on this headset is amazing. I am eager to use it in a prop aircraft so I can see just how good the noise reduction capability really is. But the thing I really like about the headset is its comfort. I have flown with a Bose before on days when I would be in an airplane for several hours and have my head hurt from the Bose being so uncomfortable. The Sennheiser is the most comfortable headset I have EVER used. The Sennheiser is not just comfortable, but it has great features. The S1 has Bluetooth syncing with your smart phone. This allows you to make phone calls and communicate using your headset. Normally I would not be too keen on something like this. However, how many times have any of us who are instrument rated been at a non towered airport and not be able to contact ATC on the ground to get a clearance and the weather is IMC? This feature makes it so easy to call flight service and talk to them through your headset leaving you hands free to write down the clearance. It is just as if you were making a radio call to ACT. Another great feature the S1 has is an auto off feature. If the headset is unplugged from the airplane or not in use for a given amount of time the power supply for the active noise reduction shuts off. This keeps your batteries from running down and gives you greater usage between changing batteries. Another thing I look forward to doing now that I have returned to the flight levels is taking pictures. I enjoy capturing moments that I find beautiful. My good SLR camera needs repair. So for now I will settle for what I can catch with my phone. A picture of me standing in front of my new ride! 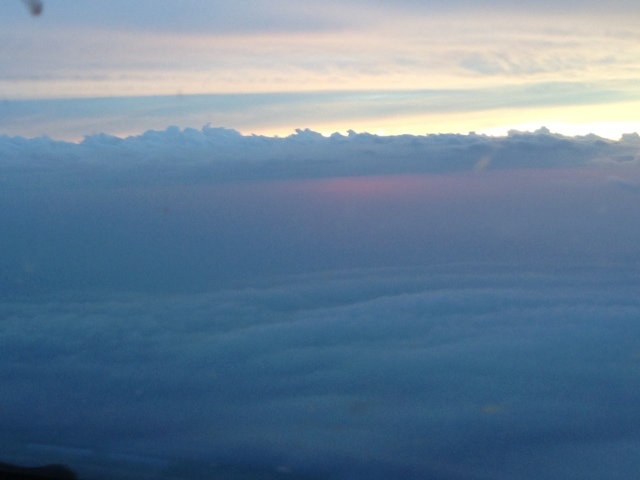 The sunrise above the clouds coming out of Memphis early in the morning. A few days ago I saw the movie "42." It is the story about Jackie Robinson. I have from time to time thought about what Mr. Robinson went through, but never could I fully understand the hatred that he felt from so many people. Watching this movie made me reflect on some of the trials of my own life. Many people think that life is hard, but we all have trials we go through. I am in no way comparing my troubles to the atrocities suffered by Mr. Robinson. However, there is a great lesson to be learned in how Mr. Robinson handled overwhelming situations. Each of us has our own way of dealing with adversity. Some people stand their ground and fight. Other people may run. Then there are varying degrees of reactions in between. Few people I know have the ability to handle situations the way Mr. Robinson was portrayed in the movie. To do this takes great control and not letting your emotions dictate your actions. I am reminded of a talk given by a church leader that I heard a few years ago. This man told a story how he started a sales representative job after college. He was assigned to work with a seasoned salesman visiting stores that carried his company's products. The duo had visited several stores and things were going well. Then they went to a store where the owner was extremely rude and treated them with disrespect. Upon leaving the store the senior salesman had a smile on his face and seemed unaffected by the conduct of the store owner. Noticing this the young salesman asked his mentor how he could be so happy after being treated so poorly. The answer was simple. The senior companion said, "I refuse to let others dictate how I feel." We all have emotions and feelings. There will be times when others are going to do or say things that will step on our feelings leaving us to have a variety of emotions. We cannot control how others treat us. But we can control how we react to these intrusions. Mr. Robinson was a man of character. Strong character is something that takes time to develop. Going through the trials of life can often times be extremely difficult. If a person fails the trials that are placed before him or her there will certainly be more trials ahead to help improve a person's character. How we react to difficult times is a choice. Everything we do in life comes from choices that we make. Many people will argue that some circumstances are beyond our control. Yes, there are events that may happen to us that we cannot control. However, how we react to anything is a choice. Often times we think we are making the best choice for the situation. However, our judgement may be clouded by our feelings. Stressful times may need a period of cooling down before reacting. Therein lies the first choice. Mr. Robinson was faced with a choice when he was being bombarded with racial obscenities from the opposing team and the fans. I am sure that this hatred was taking its toll on him. On the field he did not react. In one scene the hatred was overwhelming. In reaction he left the field and had a private moment of anger. The owner of his team approached him to console him. He was able to gather himself, go back onto the field and put the haters in their place by showing them how well he could hit a ball. Mr. Robinson made a choice to not react to such hatred in public. He took some time to get his emotions under control. He then with a renewed determination went back onto the field and did what he was so good at. How many of us when faced with difficult situations will take that time to get our emotions under control? How often do we react purely out of what we are feeling during the heat of the moment? There are going to be so many times in our lives when people will tell us that we cannot or should not do something that is a worthwhile venture. But that should not stop us. I say to the people with the negative comments to go and tell someone who is successful in that area that they cannot do it. Often times the negative people are just jealous. What made Jackie Robinson such a great man? Was it because he was a great ball player? Was it because he was the first black man in Major League Baseball? That answer to both of those questions is NO! There have been many great ball players who were not great men. There was a whole list of players that the Brooklyn Dodgers were considering to be the first African American to play in the big leagues. What made Mr. Robinson a great man was his choices. What made Jackie Robinson so great was how he chose to react to overwhelming odds. Each of of has greatness within us. The greatness comes from choosing positive reactions to both positive and negative events in our lives. We each can fly to a higher level than we think we can. We simply have to believe in ourselves. Sometimes we need a push up from someone close to us who truly has our best interests at heart. But we each have the power to rise above the odds. The abuse of a child is a horrible thing. Surviving childhood abuse affects a person in many different ways. Each survivor develops his or her own defense mechanisms to protect him or her from the pains of the world. A survivor sees the world in a different way than someone who has never been though such atrocities. It is difficult to explain to a person who has not been through such a horrific experience. As an adult I am not sure what is worse. The memories that have resurfaced about the abuse or when people call my abuser a good man. Both are extremely painful. I have tried to share with people who knew my father what type of person he really was. But all to often I hear from them what a good man he was. I wonder how good of a man they would think he was if he had hit them as many times as he did me. I also wonder what they would think of him if he had called them stupid as many times as he did me. Raising a family in the sixties a man was judged by one thing. He was judged on how well he provided for his family. That was the sole judgement of a husband, father and provider. Everyone knew my father as a good provider. That was what counted. That made him a good man. The fact that he was an abusive alcoholic meant nothing to the rest of the world. He was just good old Gibby. I saw a different side of this "good man." I saw the provider like the rest of the world. One positive thing I can say about him is that he was an extremely hard worker. But I saw the man who would come home drunk and yell at the family. I saw a man who never attended the events of his children because he was either too busy working or was at a bar and was too drunk. I saw a man who could not control his temper and was not afraid to use his fists on his children. I saw the man who came home so drunk and angry one night that he got out a shotgun and nearly killed his family. This was the type of man that everyone called a "good man." I grew up and started to become the man that my father was. I tried to change, but change came too late. I ruined the family that I had started. I was not there early on for my children. I ran from my obligations. Perhaps out of fear for being the same type of father that I had as an example. I have worked hard since then to be a good person. I strive to be the type of man that truly is good. I may fall short some days, but overall I think I am doing OK.
Society has come a long ways in how it views what a good father is today. Perhaps at times society may swing too far the other way when viewing the life of someone who has been abused. Today there are so many people who use their past abuse as an excuse that causes their bad behavior. Prisons are filled with people who claim they did not know any better because they had a rough childhood. There are also defense attorneys who use the history of abuse with their clients as a legal defense to get their clients a lesser charge for what ever crime it is the client may have committed. Surviving abuse is not easy by any means. But it is not a reason to commit crimes or abuse others. Just as bad behavior can be learned at the hands of an abuser, learning to care about others in a positive manner can be learned as well. One of the things that makes me the person that I am today is that I DO NOT want to be anything like my father. How a survivor lives his or her life is a CHOICE! Everything we do in life, whether it be positive or negative, are choices. Each and everyone of us can make the decision to good or evil. With this post I am reaching out to two different groups of people. First, I talk to survivors of abuse. Secondly, I attempt to speak to those who have a loved one who is a survivor. Both types of people are in a unique situation. The survivor has an extremely difficult task of trying to explain to someone what it is like to live with such pain that was inflicted upon them. The second group of individuals has to try to understand why a survivor views the world and relationships in a manner that most people may never understand. Sounds frustrating doesn't it? Yes, it can be very frustrating. But the best way to deal with it is just put your shoulder to the wheel and push forward. Life may appear easy for some. But everyone has trials in life. Some people think that money would make life easier and they would have no problems if they were rich. If that were true people like Lindsay Lohan or Paris Hilton would not be in the news so much while being arrested for substance abuse. So what is the answer to living a happy life if it is not money? The answer is simple, but sometimes hard to do. You simply do the best with the hand that is dealt you in life. If you feel you have been dealt a bad hand in life, then stack the cards in your favor. Work hard each day to make the next day better than the day before. For some people that might might mean having more success in their job. For others that might mean just getting out of bed the next morning. But what ever it takes, make tomorrow better than today. Overcome the things that hold you back. DO NOT LET YOUR ABUSER HAVE CONTROL OF YOUR ENTIRE LIFE! Liberate yourself from the control of your abuser. Do not continue to let him or her have control over you. If someone tells you what a good person your abuser is politely tell them how wrong they are. Do not let anyone make you feel like a bad person for what happened to you. No one should feel shame for being a victim. Many survivors feel they have done something wrong. The only thing wrong you have done in being a survivor is thinking you have done something wrong. The abuser is ALWAYS the bad guy. All survivors are VICTIMS.